At the novel's opening, Claire is a pariah in the art world. Has the community been unfair to her? In what ways, if any, is she responsible for her own exile? Does she share any blame for Isaac Cullion's death? The Art Forger explores the darker side of human nature. All of the characters in the novel have a price, a line they're willing to cross to further their own ambitions. Do you think Claire does the wrong things for the right reasons? Is she a moral person or not? What about Isabella Stewart Gardener? What compromises would you make to secure what you most desire? B. A. Shapiro juggles three plot lines in the novel, moving back and forth through time. Each section tells of secrets and deceit. How does each of these storylines intersect and deepen the themes of the novel? 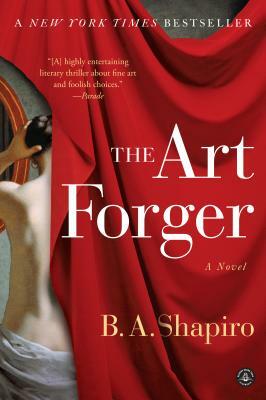 This novel was inspired by an actual art heist, which included works by Manet, Rembrandt, Vermeer, and Degas. But what if Rembrandt didn't paint Storm of Galilee? What if an unknown artist did instead? Would the painting be any less beautiful? Would it no longer be admired? Would it suddenly be worthless? What is it that gives an object value? It is estimated that 40 percent of all artworks put up for sale in any given year are forgeries. Theodore Rousseau, an expert from the Metropolitan Museum, said, "We can only talk about the bad forgeries, the ones that have been detected. The good ones are still hanging on museum walls." Does knowing this affect the way you view great art? How can we tell the difference between what is inauthentic and what is real? The novel explores the idea that we often only see what we want to see. If an expert is told a painting is a masterpiece, she sees one. If an artist desires recognition, she convinces herself that her deal with the devil is for good. How are people complicit in missing the truth? Art forger Han van Meegeren, whose techniques Claire uses to create her own forgery, was a frustrated Dutch painter. An unappreciated artist struggling for recognition, his intention was to hoodwink the art dealers and critics who refused to recognize his own artistic genius. How is Claire similar to or different from Meegeren? Shapiro has a Ph.D. in sociology and has studied deviant behavior. How do you think her background informs her characters and the ethically muddy—some might say unprincipled—decisions they make? Does it make her characters more sympathetic or less? Boston features prominently in The Art Forger. How does the author use the city as a nod to Claire's state of mind? Gorgeous art can make people do incredibly ugly things, and the novel seems to suggest that it's not only for money. Why do you think that beauty and originality can have that effect on people? What do the meetings between Edgar Degas and Isabella Stewart Gardner show about the relationship between a collector and an artist? Claire falls hard for Aiden Markel, but she keeps secrets from him. He is also keeping secrets from her. Can a relationship survive this kind of betrayal? Do you think Aiden loves Claire? Why does Claire choose the wrong men? Do you think Aiden and Claire love art more than they love each other? At the end of the novel, critics are praising Claire's work. Collectors are clamoring for the very same paintings that have hung, unsalable, in her studio for years. Why is her work suddenly more valuable? Is she successful only because she has become a celebrity? Is art a commodity like any other product? What does the book suggest about the intersection of art and commerce, about talent and reputation? Sometimes getting exactly what you want isn't quite what you expected. Our society loves to create celebrities and then tear them down. Can you give some examples? What happens when your dreams are realized and you can't handle it, or you don't feel you've earned it? Does Claire deserve the fame she is awarded at the end of the book?